Note: Although Waterboys came out in 2001 (wowie, a decade ago?! ), I guess there are still people who haven’t seen it or only watched it recently, like myself. So, for those who haven’t seen Waterboys, I would suggest that you not read this post yet because it might spoil the scenes for you and you’d likely not find it as humorous as I did if/when you do watch the movie. Eye candies Kwon Sang Woo and Song Seung Hun star in a new movie titled A Destiny. This marks their second (?) collaboration after the movie Make It Big. Watch a [cute] interview of the two men below, if you haven’t already seen it. Special thanks to vicstorm2004 for uploading the clip. The new film also features Ji Sung. Man, Park Han Byul is one lucky girl. If you’re interested, here’s the Soompi thread. 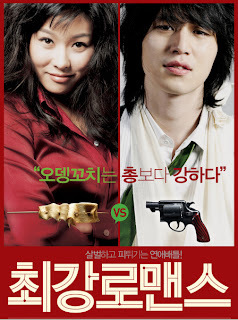 This blog entry is dedicated to Wookie’s new movie, The Strongest Romance. It premiered on January 25th! That’s Lee Dong Wook and Hyun Young singing! The movie My Father drew attention even before it started shooting because it stars the half-Korean heartthrob Daniel Henney. The film follows a Korean adopted by an American family who comes to Korea to seek out his biological parents, only to find that his father is on death row. Henney plays James, who volunteers to join the U.S. Forces Korea as a way to find his biological parents. On the first day of shooting on Jan. 10, he successfully shed his gentlemanly image for his role as the young adopted man who slowly opens his heart to his jailed father. “I will try hard to use my personal experience of living in the U.S. to play James, who has lived his life feeling estranged as an adopted child,” Henney said. My Father is the feature debut of director Hwang Dong-hyeuk, who attracted plaudits at home and abroad with his short film Miracle Mile starring Karl Yune. Kim Young-chol plays Henney’s father. doozy: Wow. Daniel Henney is busy these days, with one project after another. Good for him! I wonder if his acting and Korean have improved. Has anyone seen Seducing Mr. Robin? The new action fantasy epic The Restless (Chungchon) is visually enjoyable. State-of-the-art computer technology allows good-looking actors to live in a fantasy world, and there are spectacular action scenes. But these elements fall flat because of the inadequate development of the story. Viewers will soon realize that the film satisfies their eyes but not their heart. Directed by Cho Dong-oh, the film tells the story of a couple who are separated by death but meet again in “chungchon,” a place between earth and heaven where the souls of the dead stay for 49 days to erase their memories and prepare for reincarnation. In the film, So-hwa (played by Kim Tae-hee) and her lover I-gwak (Jung Woo-sung) face a tragic fate. So-hwa is killed by villagers after being falsely accused of being a witch. I-gwak believes her death is the result of his power to see ghosts, and his talent eventually leads him to join the royal guard of ghost hunters in the late Silla Kingdom. The guards’ rebellion against a corrupt monarch fails, and all the members are killed except for I-gwak. While on the run, I-gwak is wounded, and he hides in a shabby temple, where he accidentally enters chungchon. In the semi-heaven, he encounters So-hwa, who has become a goddess, but she doesn’t remember him. He finds out that the dead members of the royal guard are plotting to return to earth to change the rule of the world. Now his former colleagues appear to be the biggest threat to So-hwa, and I-gwak decides to fight for her. The storyline alone is enough to attract fantasy fans, and the visually superb rendition of the semi-heaven and action scenes have few technical flaws. Rivers, mountains and temples are beautifully rendered. The scene in which I-gwak fights against some 30,000 ghost soldiers to save his lover is especially impressive. But the story is not properly developed. The long story, which probably needs more than three hours of running time, is cut down to one hour and 40 minutes. The result is that many important parts are missing or summarized in dry dialogue. It’s hard to sympathize with the couple’s tragic love. It’s not easy to know how desperate the couple are to be with each other or why I-gwak wants to save So-hwa so badly. Or why the men in the guard can’t easily kill I-gwak. The Restless was promoted as a film for the Christmas season, but watching it is like receiving brilliantly decorated gift box that is disappointingly empty. doozy: Ouch! This review is harsh. Regardless, I will still watch this movie when it’s available even though it’s probably more Korean Wave material than a solid, good movie. Eh, who cares? I like fluff stuff. SEOUL, Nov. 9 (Yonhap) — Fresh from making hard-boiled thrillers, South Korea’s Park Chan-wook said Thursday that he wanted to deliver a romantic story that “smells like fruit” this time. I’m a Cyborg, But That’s Okay, Park’s seventh feature, is to debut in theaters next month, basking in the heightened attention for its male lead, star singer and actor Rain (called Bi in Korean). Dubbed as “a kind of romantic comedy” by the director, the story of a young female mental patient who believes she is a cyborg and her male mate who chases after her marks the director’s return, far from the the Vengeance triology. “Believe it or not, it’s true that this is the movie I made,” Park said in a press conference to announce the end of the producton. Its female lead is Lim Soo-jung, who played a blameless heroine in the popular Korean television drama series, Sorry, I Love You, which aired last year in eight Asian countries, including China, Japan, Singapore and Vietnam. “The mental patients all have their own unique universe. It could be nothing more than an illusion in the eye of normal people. But it is an indispensible one, the only and very realistic world to that person. So if they talk to each other about their own universe, wouldn’t that be a kind of what we call love?” he said in a Seoul hotel packed with hundreds of local and foreign journalists, where some scenes from the film were screened. Making his screen debut with the established director, Rain said he saw the pristine state of humans from the wacky, disorderly mental hospital. “I interpret this movie as a message of hope for the world. The patients in the hospital live with feelings of irritation and distance from the world, but I felt that they are very good natured and naive and more highly-focused than any normal people,” he said. I’m a Cyborg, But That’s Okay is to be released nationwide on Dec. 7. A group of Korean actors and actresses visited Japan on Monday to promote their movie Sad Movie scheduled to be released in the island country on Nov. 11. The Japanese Sankei Sports Shimbun reported Tuesday that Jung Woo-sung, Cha Tae-hyun, Shin Min-ah, and Yeo Jin-gu had arrived at Haneda International Airport, where some 250 fans greeted them with loud cheers. The Korean stars returned the welcome with smiles. Jung told the fans that he was so thankful to them for welcoming him every time, and Cha said that he would do his best to promote their movie. The Japanese sports daily said that the omnibus movie consisting of four stories portrays love, sadness and memories in life by showing eight characters parting with their lovers and families. Having attended the press conference on Tuesday, the four will appear at a premiere on Wednesday. Then they will give interviews with various media outlets before coming back home on Saturday.